This painting was done during the inaugural Cape Ann Plein Air competition in October 2016. Bass Rocks is an area along the coastline of Gloucester, Massachusetts. Often called the ‘backshore’, it is a rugged, rocky coastline – not great for swimming and sunbathing, but great for en plein air painting! I like to paint in the Cape Ann area as often as I can. 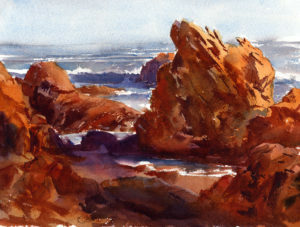 There is much to be seen and painted in the area, but the Bass Rocks is one of my absolute favorite places to paint – this is a representative sample of paintings and sketches from bass rocks. 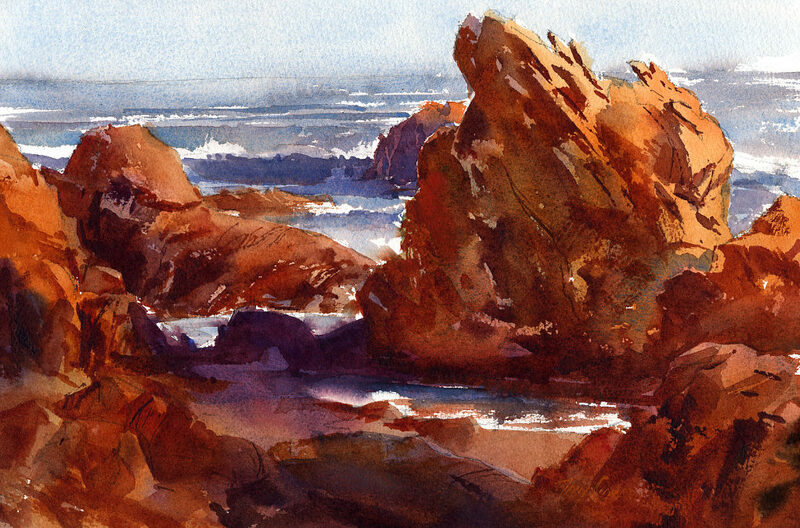 The rugged, warm, orange-tinted rock faces create stark edged contrasts in all kinds of light. On this particular afternoon, high afternoon sun lit up the the upper faces while creating a warm-cool glow in the shade areas along with deep, rich cool shadows. Water of the incoming and relatively calm tide was a cool light blue – perfect color contrast to emphasize the overall warm light. Painting is 11″h x 15″w. Un-framed and un-matted – waiting for your framers touch! All paintings sold online are un-matted and unframed. Well packed, well protected and insured. Shipped via USPS Priority mail.